Life comes at you fast, according to the Twitter meme. Over the last few days a number of things collided in my Twitter feed that were just fascinating. And they wove themselves into a wacky plaid of wizards, prophets, science communication, genomics and anarchist plant pathogens. Let’s do some time travel around the world and look at them. As you can see from this poster from early in the previous century, stem rust has been a serious problem for farmers for a long time. In the US, the barberry plant was a species introduced by Europeans used for a variety of purposes, some for the wood, reported medicinal qualities, and as an ornamental plant. It was also known to harbor the rust pathogen, and there was an extensive science communication effort to raise awareness of this — including memes and cartoons. It was combined with a citizen science program to eradicate barberry. 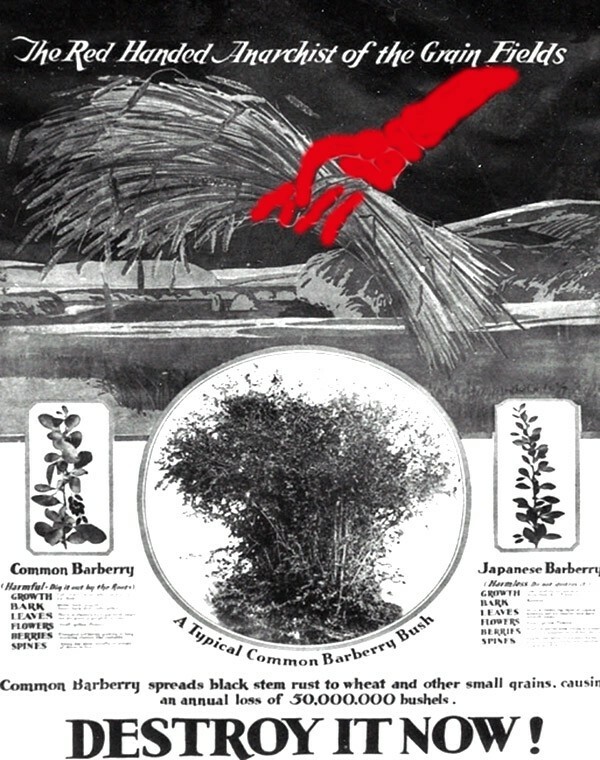 The USDA program was re-visited in “Barberry or Bread” with great examples of the campaign literature and efforts. Later in the century, plant breeders including Norman Borlaug were able to create resistant crops that bought us some time and reduced the need to assault the barberry. Plant scientists and plant pathologists have been warning us for a while about a new strain of wheat rust — Ug99 — for a while now. It’s got some notice in mainstream places: Norman Borlaug himself tried to warn us that Stem Rust Never Sleeps in the NY Times in 2008. Revkin reported some progress soon after. Breeders were trying to outrun the pathogen, but it’s a tricksy foe and efforts were failing. Kerry Grens assembled a nice WWS (Where We Stand) summary for The Scientist in 2014: Putting Up Resistance. If you want to learn more about the Ug99 issues around the world, Undark recently presented an excellent overview of the “scourge of Ug99” with important perspectives from around the world. 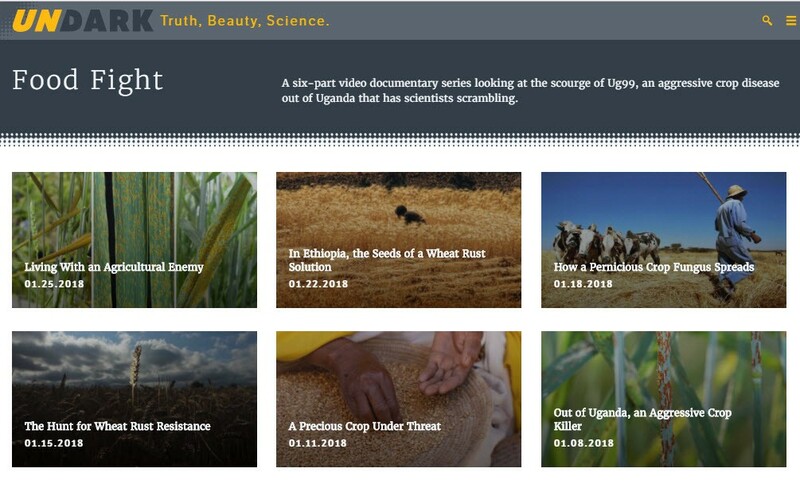 Including one plant pathologist, Ruth Wanyera, examining barberry bushes as you can watch in Episode 4. The other day a new spore of information on rust drifted through my twitter feed. We report the first wheat stem rust occurrence in the United Kingdom in nearly 60 years, with only 20% of UK wheat varieties resistant to this strain. Climate changes over the past 25 years also suggest increasingly conducive conditions for infection. Furthermore, we document the first occurrence in decades of P. graminis on barberry in the UK . Our data illustrate that wheat stem rust does occur in the UK and, when climatic conditions are conducive, could severely harm wheat and barley production. That image was from the program I mentioned at the top — the USDA barberry outreach eradication effort. In the Communications Biology paper from the tweet, we also learn that in the UK there have been citizen science programs to restore — wait for it — barberry. Kamoun illustrated this program with a subsequent tweet. Environmentalist “prophet”-leaning groups have been restoring barberry to help the endangered moth. I would support that effort and possibly have planted barberry if that was presented to me. But…what if a side-effect of this is harmful to grain production? Does it become barberry or beer? Which one do we choose? The Scientist article “Putting Up Resistance” made it clear that some people have chosen for us already. Note: Dubcovsky’s hands aren’t tied by the red anarchist hand of the pathogen above. They are tied by resistance to GMOs. Is it more like “both/and”? I have no problem with that. We can have both. We maybe can have new types of plant resistance and maybe can restore the barberry to save the moth at the same time. What controls do you want to run? Or will our hands be tied? Can you consider the idea of both/and? Can you envision the co-existence of GMO wheat and barley and a thriving carpet moth? I think it’s worth a try. Mary Mangan PhD is a genomics scientist, with credentials in microbiology, immunology, plant cell biology, and and molecular biology.